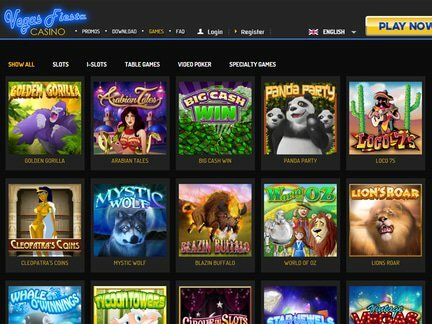 Vegas Fiesta Casino's main page is designed in an original way. It will surely appeal to French players who are tired of visiting casino sites with a nearly identical appearance. The visitors will see a very nice picture of a city in the background. It can serve as a reminder of Vegas and the kind of experience that can result from a trip. Once the player clicks on the scroll down menu, a wide variety of gaming options and promotions will appear. A list of winners will also become visible along with the recent winning amounts. Right now, the promos section features six offers. A 150% welcome bonus up to €450 is offered on the player's first deposit. This is a free cash Vegas Fiesta Casino Bonus deal offer that could not be missed! There is also a 100% cashback deal up to €300, which allows the player to re-credit the account with the wagered cash. 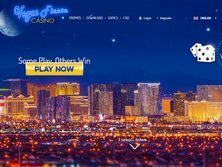 On top of that, the casino provides a 10% VIP monthly refund and the chance to convert one's loyalty points (such points can be easily collected on the site) into special gifts. Various weekly tournamenets are also held at the venue. Up to €200 000 can be won during such events. A daily 400% bonus on all deposits is the last offer that can be seen in the promo section. Numerous payment options are enabled here. All transactions can typically be conducted using the following services; Visa, MasterCard, Maestro, Neteller, Ukash, Skrill, Poli and PaySafeCard. The whole registration process only takes a few minutes. The players gets to choose between games in the free mode and real money gaming. Inexperienced players are certainly better off with the first option. The website is available in English and French. It is particularly suitable for French players. Each person has to check whether the national laws do not prevent online casino gaming within such an environment. That responsibility rests on the player, since a list of country-specific restrictions isn't provided. The nice thing is that the flags of various countries are displayed in the latest winners section. That could provide some clues when determining whether any restrictions ought to be expected. It is easy to locate the hottest games even when a category for such games isn't present. Right now, the casino hosts the following game titles; Arabian Tales, Golden Gorilla, Big Cash Win, Panda Party, World of Oz, Blazin Buffalo, Lions Roar, 5 Reel Circus, Vintage Vegas, Pistols & Roses, Wheel of Cash, Fortune Fortunes, Aussie Rules, Keno, Diggin Deep, Astral Luck, Wild Safari, Spy Game, A Switch in Time, Blackjack Multi-hand, Reel Party Platinum, Diamonds Down Under, Money Magic, Goldenman, Five Reel Bingo, Gnnopme Sweet Home, Winter Wonders, Wild Carnival, Beach Bums, Scary Rich, Crazy Camel Cash, Moonlight Mystery, Tiki Treasure, and a whole lot more! The French players have appreciated the casino to such an extent that critical voices are entirely absent. The players from other parts of the world have likewise been silent about any possible imperfections. Nevertheless, the users must remain cautious. The casino staff respond to any inquiries by live chat and e-mail. Their chat window is available on a 24/7 basis. The FAQ section doe not mention anything about a license. The credibility of the casino is always called into question with such major omissions. It would be beneficial if the casino placed such information on the front page. Such a statement can typically be found at the bottom of the page in any normal online casino venue. It makes one wonder why the casino is an exception to this rule. I have a bit of a problem with the fact that the Vegas Fiesta Casino has refused to publish licensing information. I am much less concerned with the promotional offer. There are plenty of deals to keep the players satisfied. Likewise, the game offer is quite neat! If the casino makes some changes, it could still be a potentially good option for players, especially French-speaking individuals.